Our early morning departure from Xiamen turned out to be something of a cross country adventure – a one hour commuter bus to the coach station and a four hour intercity coach to the outskirts of Hong Keng were a microbus picked up our luggage (but not us) – giving us a chance to stretch our legs with a half hour stroll to our family homestay. 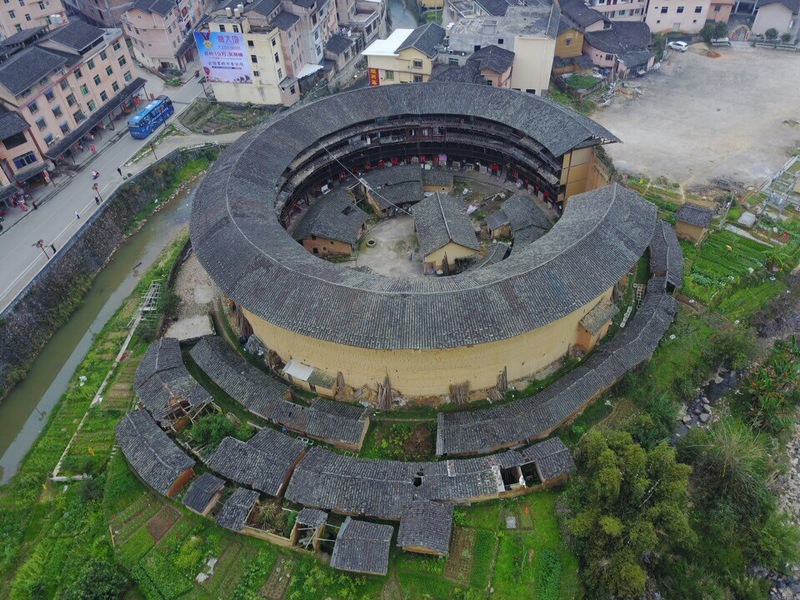 Hakka village is famous (particularly among Chinese tourists) for its Tulou round houses – which date back several hundred years. The donut or square sharped houses are an amazing example of inter-generational living. Built by the founders in the 1700 and 1800s and now home to their great great great grand children and their families – some housing up to 600 people. The village today survives on tourism, subsistence farming and rice wine. It’s become something of a pilgrimage sight for Chinese politicians wanting their photo taken in a traditional ‘Chinese setting’ and as a result the streets were teaming with tour groups, although we were the only westerners in town. We wandered along the river until we reached our homestay with Mrs Lin and her family in a traditional round Tulou. It was getting dark so we headed to our rooms to change before dinner – the rooms were basic, a rock hard bed in a room clad floor to ceiling in timber panelling and the overpowering feeling of damp everywhere. From the bedding to the air, everything felt damp and muggy so we headed down to the communal sitting area on the ground floor for a local dinner of….rice and fried vegetables, pork and chicken. After dinner we headed out in the dark for an orientation walk to the top end of the village, passing jovial locals enjoying their evening. Back from our walk we retired early for a film and good nights rest before our 8am orientation walk. Travelling with the drone and a small store of electronics has proved a logistical challenge in terms of charging, downloading, saving, editing, uploading and blogging. Needless to say every night it takes longer that expected – especially in China were the Internet can be such an unknown from city to city. 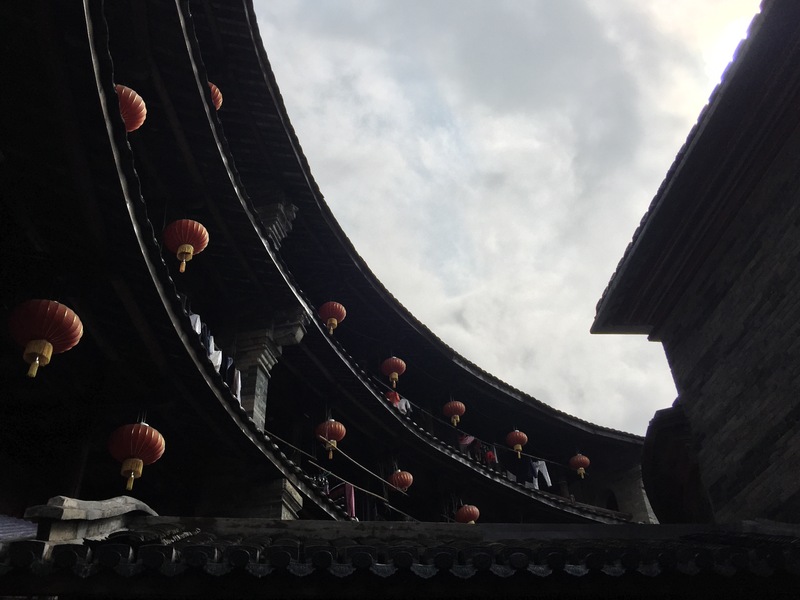 We met the group at 8am and set out on a slow walk around the village, exploring the largest Tulou in town and wandering along back streets, through courtyards and browsing stalls as we went. 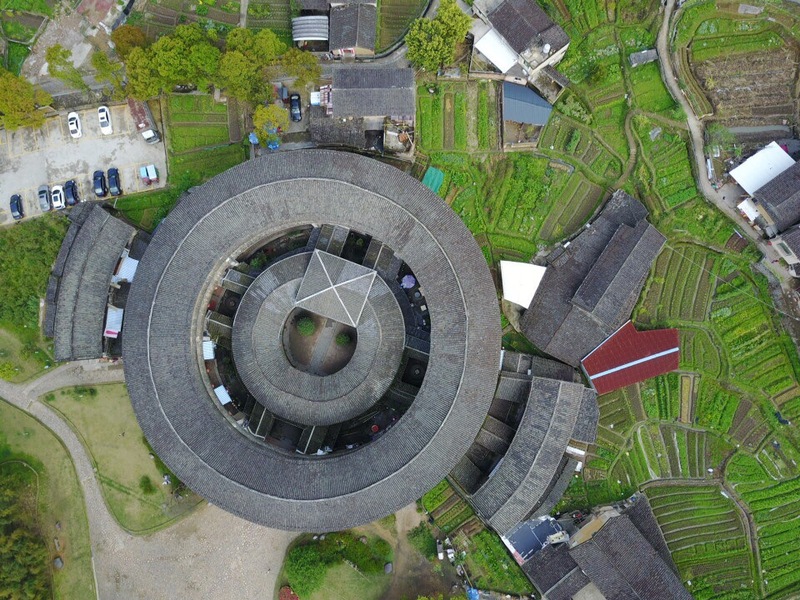 The Tulou provided an excellent opportunity to fly the drone overhead for a pin drop style look inside the perfectly concentrically circular house. As we continued our walk every corner offered another unique glimpse of rural China and we hoped we’d got some decent snaps. We met Mrs Lin for a tea tasting session – all grown locally by her family. We partook enthusiastically but couldn’t buy any, concerned that our next stop in Australia would be a no no for imported consumables. Instead we agreed to meet her an hour later for lunch. With an hour to fill, Howard our guide enthusiastically suggested we go for a short hike up a nearby hill to get some drone footage. From our vantage point we managed a 10 minute flight up and down the valley – all the way back to our family guest house, where Howard asked whether we could see if Mrs Lin was ready with our lunch! That was our queue to pack up and head back for more fried Chinese food and rice! 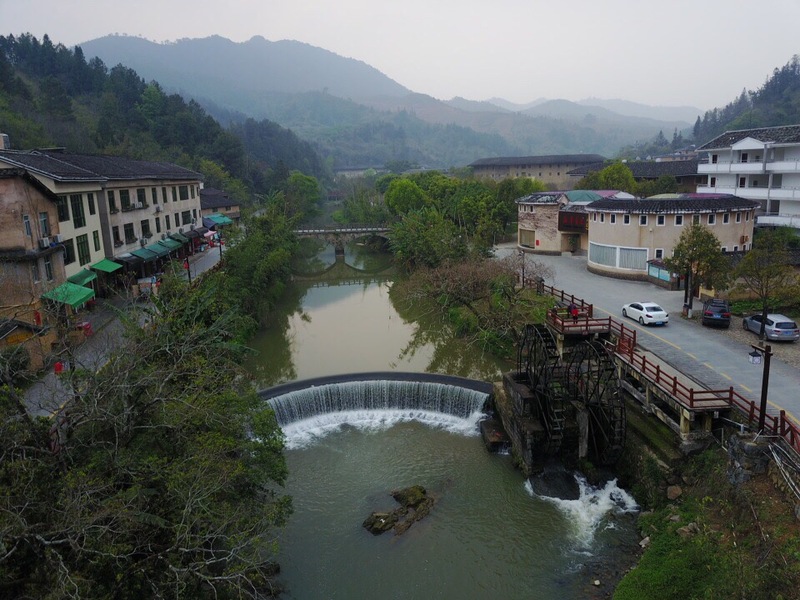 Our afternoon in Hakka village gave us some personal time for more flying – first over several Tulous and then to attempt a low fly along the river to the large water wheel and waterfall. We chickened out of the skimming route – scared off by the overhanging branches and instead went for an over and down approach with some decent results. Still full from the months supply of rice we’d eaten earlier we headed to our room to catch up on some blogging and social media – after six hours and a number of failed attempts at getting the blogs uploaded we called it a night. We decided to delay packing until 7am ahead of our 8am meet the next morning and 8 hours of travel to Shenzen.